Sarah McNaboe knows that when it comes to communicating science, one picture really is worth a thousand words. Sarah is sailing as our Scientific Illustrator on IODP Expedition 335 “Superfast Spreading Rate Crust 4,” and for her, this opportunity is a dream come true. As Scientific Illustrator for Expedition 335, Sarah is helping us develop innovative ways to share the science of our expedition with the wider scientific community and the public at large through her drawings and illustrations. In the coming days, we’ll be featuring more of her scientific illustrations on this blog. 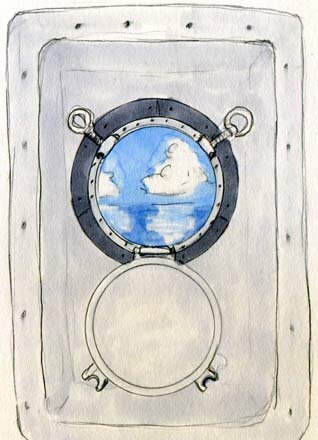 Meanwhile, we thought you’d enjoy seeing some of Sarah’s more lighthearted and informal sketches that help to capture some of her personal experience at sea. Sarah was selected for this opportunity after undergoing a highly competitive application process. She holds a B.S. in Earth Sciences/Environmental Geology from the University of California Santa Cruz, which helps her to understand the science of this expedition. In 2010, Sarah completed her Certificate in Science Illustration from the Science Illustration Program at California State University Monterey Bay. Sarah then went on to complete a 10-week internship at the Smithsonian Environmental Research Center Education Department in the fall of 2010, where she created detailed drawings of plankton, as well as watershed and trail maps. Sarah has also created line drawings of ships for the Annapolis Maritime Museum and currently has two works on exhibit at the Morton Arboretum Sterling Library in Lisle, Illinois, for the annual Guild of Natural Science Illustrators Exhibit. You can see more of Sarah’s illustrations on her website, www.illustrationbysarah.com.